We know our blog readers are superstars when it comes to best practices for safety for themselves and their families, but don’t forget to watch out for those wonderful animal companions we share our homes and lives with. Now that the holiday season is in full swing, here are some simple things you can do to ensure your pets stay safe. 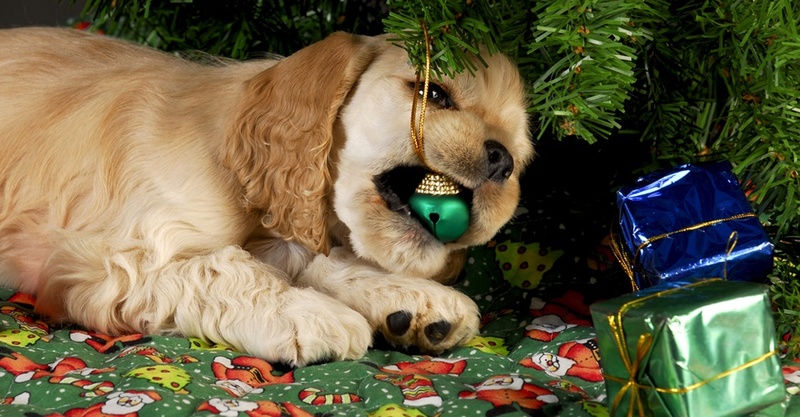 Securely anchor your Christmas tree so it doesn't tip and fall, causing possible injury to your pet. This will also prevent the tree water—which may contain fertilizers that can cause stomach upset—from spilling. Stagnant tree water is a breeding ground for bacteria, and your pet could end up with nausea or diarrhea should he imbibe. Opt for just-as-jolly artificial plants made from silk or plastic, or choose a pet-safe bouquet instead of real holly and mistletoe, which can cause significant health problems when ingested. Keep wires, batteries, and glass or plastic ornaments out of paws' reach. A wire can deliver a potentially lethal electrical shock and a punctured battery can cause burns to the mouth and esophagus, while shards of breakable ornaments can damage your pet's mouth and digestive tract. Make sure to keep your pets away from the table and unattended plates of food, and be sure to secure the lids on garbage cans. Don’t give them treats from the “no-eat” list! Dr. Herron suggests trying to maintain a consistent routine including feeding and exercise schedules. Pets, especially dogs, can get 'cooped up' during the winter, so it is important to make sure they get plenty of exercise and enrichment. Some animals are not comfortable with strangers, so if you plan to have visitors, provide a 'safe haven' for your pets. This can be a room where pets can retreat to and enjoy toys and food enrichment. When pets are in this area, try to avoid disturbing them. If your pets get very anxious or aggressive around visitors, it may be best to board them. This will help avoid unneeded stress for you and your pets." Whether yours are furry or feathered, young or old, be sure to give your pet’s safety a little extra attention during the hectic holidays.